What do you get if you cross some fabulous blogging mums with a prize winning daddy blogger? 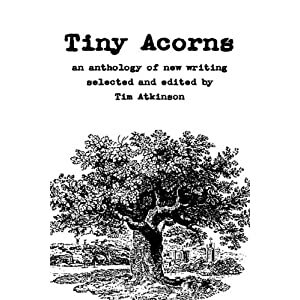 The answer is an amazing book called Tiny Acorns. Tim (the editor) ran an online creative writing course and this book resulted form some amazing subnmissions.) many bloggers got involved, I know a couple of blogging mums whose work is included in the anthology Nickie O’Hara, Sandy Calico , Susan Mann and my very good pal Carol Smith. All these ladies are brilliant, entertaining bloggers and clearly creative writing is a talent they share. The on-line creative writing e-course run by Tim Atkinson (@dotterel) on the blog www.bringingupcharlie.co.uk (the full text of which is included in the Appendix) was hugely popular. It is brilliant it is reprinted here in full because if you are keen to write you need only buy this book to access and tried and tested course. Online mum of one is one of the short stories written by Tim himself and it made me laugh out loud as it tells the tale of a new to blogging but soon addicted mummy. Hysterical. The first meeting by carol Smith really gets you with the twist at the end and the imporatnce of family when you have a baby all your family just resonates. This book is just £5.99 from the Dotterel Press including free P+P its entertaining, educating and all profit goes to a great cause. Why it’s practically perfect ! 😉 I certainly really enjoyed it. All proceeds from the sale of this book are being donated to the BBC Children in Need Appeal. Next Post UK shoppers are demanding more bargains – but where do the biggest bargain hunters live?